Hawaiian Airlines said yesterday it swung to a profit of in the second quarter of $1.8 million, or 4 cents a share, after it raised fares, added capacity and cut costs to help offset fuel prices. That net income excludes a one-time $52.5 million gain from Mesa Air Group to settle a lawsuit regarding the Phoenix-based carrier's misuse of information obtained in 2004 during Hawaiian's bankruptcy. With the settlement, Hawaiian had a profit of $54.3 million. The airline rapidly ramped up operations following the shutdown of ATA and Aloha airlines at the start of the quarter, inflating revenue per available seat mile. Operating expenses for the airline increased by 32 percent, excluding a one-time credit related to the settlement, with fuel being the most significant driver. Excluding fuel, the company's year-over-year cost per available seat mile increased 9.4 percent. Hawaiian Airlines is again back in black, but barely. Excluding a one-time $52.5 million gain from a settlement with Mesa Air Group relating to interisland carrier go!, the carrier said yesterday it had second-quarter net income of $1.8 million, or 4 cents a share. Cost-cutting measures and higher fares helped pull the company to a profit from the previous quarter's loss on rising fuel costs and excess capacity. However, Mark Dunkerley, president and chief executive officer, said what is essentially a break-even profit "isn't terrific" during Hawaii's peak tourism season. The quarter ended June 30, while Hawaii's total visitor arrivals that month dropped 14.2 percent. 81% The percentage increase in fuel costs from last year to $123.4 million, representing 38.2 percent of operating expenses excluding a one-time gain. 72% The percentage increase in Hawaiian's average cost per gallon of jet fuel year-over-year in the second quarter to $3.63. 20% How much more fuel costs than it did in the beginning of the second quarter, when ATA and Aloha airlines went out of business. » During a quarter, Hawaiian increased capacity by 3.4 percent in terms of available seat miles; the company said capacity will jump about 3.5 percent in the third quarter from last year. "Prices are at where they cover the costs," Dunkerley said in an interview. "Clearly in a difficult economic environment, the rising prices are only a part of the explanation for the reason for why tourism numbers are going down." Fuel costs increased 81 percent from last year to $123.4 million and represented 38.2 percent of Hawaiian's operating expenses excluding the one-time gain. Out of the top 10 domestic airlines by market share based on revenue passenger miles, only Southwest Airlines posted a profit for the quarter, due largely to its success in hedging fuel prices. All carriers said fuel costs negatively impacted financial results. Including the one-time settlement gain, Hawaiian had a profit of $54.3 million, or $1.09 a share. That compares to a loss of $3.9 million, or 8 cents a share, a year ago. Revenue was $319.2 million, up 31 percent from last year's $244.2 million. 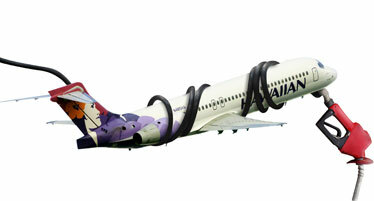 "The collapse of both Aloha and ATA occurred in the first week of the quarter, so our financial results reflect the amalgam of increased revenue from carrying 21 percent more customers, the cost of the additional flying we have mounted to meet the demand for interisland travel and some substantial transition costs as we grow quickly to fill the void," Dunkerley said in a statement. Trans-Pacific capacity in the third quarter was 3 percent lower than last year, a trend Hawaiian expects to continue through the second half of this year. Trans-Pacific revenue contributed slightly more than 60 percent of Hawaiian's passenger revenue in the quarter. Before shutting down operations, Aloha and ATA accounted for 18 percent of seat capacity between the West Coast and Hawaii, Dunkerley said on a conference call with investors and analysts. With this capacity gone, overall West Coast capacity declined by 17 percent in the quarter. Hawaiian had competed with ATA on service to Phoenix, Los Angeles and Las Vegas. 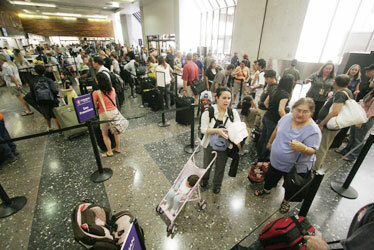 People headed to San Francisco on Hawaiian Airlines stood in line at the check-in counter in April. Passengers were stranded by the shutdown of ATA and Aloha Airlines. "We expect a similar reduction for the industry in the back half of 2008," Dunkerley said. While trans-Pacific revenue per available seat mile jumped 20 percent from last year on rising fares, load factor was essentially flat during the quarter with year-over-year increases in April and May offset by a slump in June of 5.5 percentage points to 81.5 percent. Interisland capacity increased 28 percent on an available-seat-mile basis -- or one seat transported one mile -- with average seats per day increasing to 19,600 compared to 15,200 a year ago. Interisland revenue per available seat mile increased by more than 40 percent, boosted in part by the year-ago comparison to fares as low as roughly $10 one way due to competition by go!. Since Aloha's demise, Hawaiian has raised its lowest fares twice, to $64. "Interisland remains a very competitive market," Dunkerley said. "Like Hawaiian, Mesa has increased its capacity substantially since the beginning of the quarter. It's clear however, that at least for the moment the destructive competition over the last couple of years has abated." Overall load factor is expected to decrease by 8 to 9 percentage points in the third quarter, with July load factor expected to decline more than 8 percentage points from last year to 79 percent. Hawaiian launched service between Honolulu and Manila four days a week on April 14. Although Dunkerley said traffic is building in line with expectations, the route has been "dramatically affected by the relentless increase in the price of fuel." The airline also launched daily service to Oakland, Calif., in the first week of May, entering a market vacated by Aloha and ATA. Dunkerley said ongoing contract discussions should not impact the training of pilots for its four leased Boeing 717s going into service later this year, boosting its fleet of 717s to 15. Hawaiian is set to meet next month with the Air Line Pilots Association, which represents more than 300 pilots at the company. Hawaiian hired 380 employees in the quarter to handle additional capacity and expects to return to normal attrition and replacement levels next quarter. During the quarter, the company paid a bonus of $2.5 million to employees, offset by a similar charge in 2007 from voluntary separation packages offered to employees in the company's outsourcing of accounting and information technology operations overseas. Rents and landing fees increased by $2.1 million year-over-year from increased activity and state rate increases.